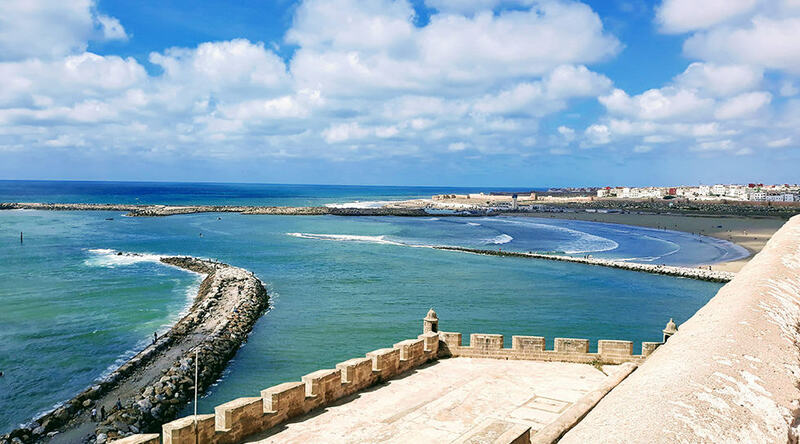 Morocco is a country where the old meets the new and this tour has been designed with the ancient caravan trade route, which stretches from Marrakesh to the Sahara desert, and modern cities in mind. As you pass little berber villages and view old buildings perched in the High Atlas Mountains, and visit Kasbahs, including Aït Ben Haddou, you will realise that you are entering another land, with a much older, harsher way of living and different laws. You will meet locals in the desert gain an understanding of desert life as you walk on the golden sand dunes of Erg Chebbi. As you continue your journey through Morocco, you will experience different cities, each one with its own distinct style and flavour. 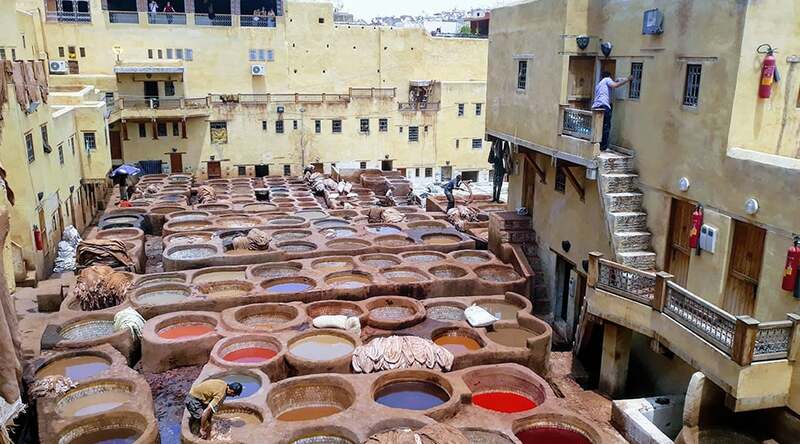 There is a lot to learn and experience in the imperial cities of Fes, Marrakesh, Meknes and Rabat. You will relax as you walk amongst the calm yet stunning Chefchaouen, which is also known as the Blue Pearl. You will be free to walk amongst the Roman Ruins of Volubilis and soak up the ancient atmosphere. There are many opportunities for you to meet locals and learn about Morocco through its people, history, culture, art, music, food and architecture. 08:00am pickup from hotel/riad or any location in Marrakesh. Lunch at a traditional restaurant in Aït Ben Haddou (Berber: ⴰⵢⵜ ⵃⴰⴷⴷⵓ), a fortified village and a famous UNESCO world heritage site which is locally believed to have been established in 757 AD, whilst the adobe buildings date back to the 17th century. You are free to marvel at the stunning architecture and explore the city by yourself or with a local guide. Many films have used this backdrop for historical scenes and it is considered to be the film capital of Morocco. Some examples of films made in Aït Ben Haddou are: Gladiator, Lawrence of Arabia and Jesus of Nazareth. Drive to Ouarzazate with the opportunity to visit film studios, Kasbahs and walk amongst the palm groves. Spend the night in a hotel in Ouarzazate. 08:00 pickup from your hotel. We will pass through the perfumed Kelaat M’gouna, the Valley of the Roses (which has an annual festival in May with Berber performers, food and music). You have the opportunity to explore the rose shops and visit a rose distillery factory. You will enjoy the rich and vibrant rose fields and rose beauty products, such as perfumes, soaps and rosewater. Drive to Dades Valley, where you will be able to admire the rock formations, such as the Monkey’s Feet, at Dades Gorge, Kasbahs and the scenery along the Dades river. Drive along the picturesque road of 1000 Kasbahs. Kasbah means fortress and these strategic ancient fortresses were built by an oasis of water and close to food sources. The Kasbahs were also important for trade within their walls and traders could stop there and receive respite from the harsh Saharan climate. Visit Todra Gorge to view the orange limestone and the 300m deep fault that splits the rock. At certain places you can view the ravine with it’s river flowing through the split. You will view green palmeraies, rock climbers and trekking enthusiasts that are motivated to squeeze through the narrow openings. Spend the night in a hotel in Todra Gorge, with stunning views of the gorge. 08:30am pickup from your hotel. Drive to Erfoud and witness the area’s rich fossil deposits on display in a museum and watch craftsmen at work. Archaeology lovers will be thrilled to walk around Erfoud and view Morocco’s underwater past from the Palaeozoic era (approximately 540 million to 240 million years ago). Erfoud is also known for it’s date palms and there is an annual festival in October, with traditional music and songs, prayers, processions and camel races. 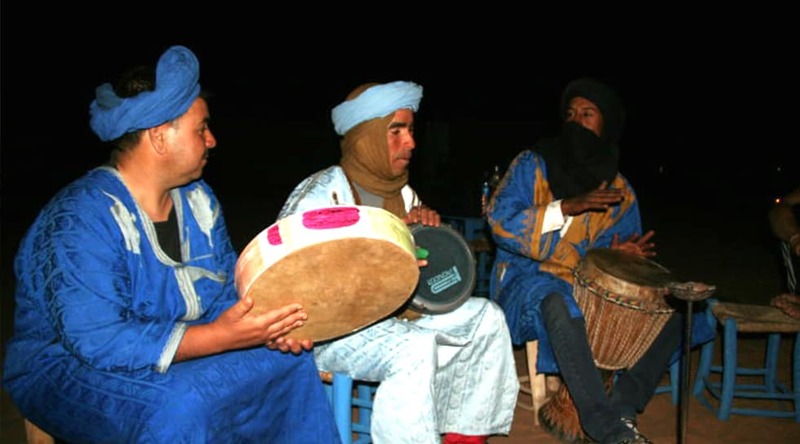 Reach Merzouga, where you will be greeted by camel herders and embark on a camel ride into the desert for 1 hour. As your camel strolls into the desert and you relax upon them, you will experience an inspired sunset. View the highest sand dunes at Erg Chebbi. Close to the Algerian border, Erg Chebbi will charm you with it’s rolling, golden sand dunes. You can choose to walk or trek across the dunes. If you are feeling more adventurous, we can arrange an electrifying experience, such as quad biking. For sporty people, sandboarding is a fun choice and it’s slower than snowboarding, so easy to do at your own pace. Embrace traditional Moroccan music and food, including the famous Moroccan mint tea, also known as Moroccan whiskey and sleep in your own private tent. You will be invited to sit around a campfire and listen to traditional drumming and dancing, and meet travellers from all around the world. You will feel free to savour the moment and walk on the golden sand underneath the starry night. This is a chance for you to briefly experience the life of a desert nomad and converse with Berber people. Early morning breakfast and experience a sahara sunrise over the dunes of Erg Chebbi. Camel ride out of the desert where your driver will be waiting for you. Drive through villages and Draa Valley and visit Taourirt Kasbah with time for lunch along the way. Drive through the Atlas Mountains, with regular breaks and photo opportunities. We say farewell at 18:30 as we drop you off at your hotel or riad in Fes. Pickup at 09:00am from your riad or hotel. A local guide will accompany us on our tour throughout the city. 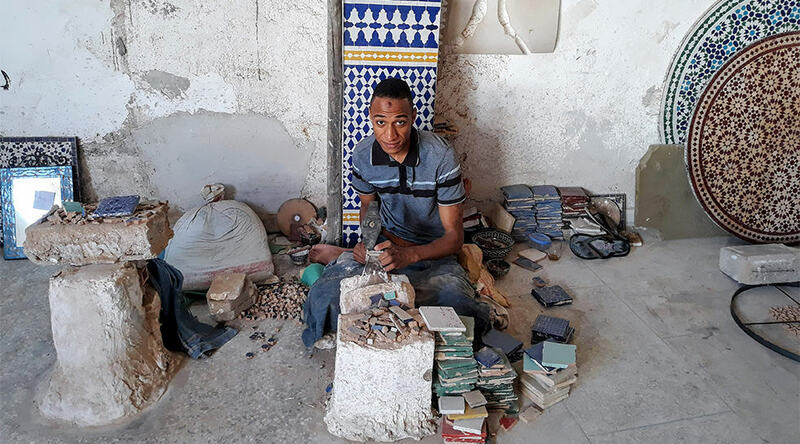 He will take you sightseeing to places such as the Medina, museums, the Royal Palace, the famous leather tannery and the University of Karouine (which was founded in 857 AD). You may also wish to visit a pottery and zellij tile cooperative, where you can learn how pottery and zellij tiles are made. You can also take pictures of the artisans whilst they work and even participate and assist local artisans. Lunch will be at a traditional restaurant. Drop off to your riad or hotel. Pickup at 09:00am from your hotel. We will drive to Chefchaouen (the blue city), which will take 3 hours and 40 minutes. You will have the opportunity to stroll through the stunning blue and white coloured Medina and the souk. 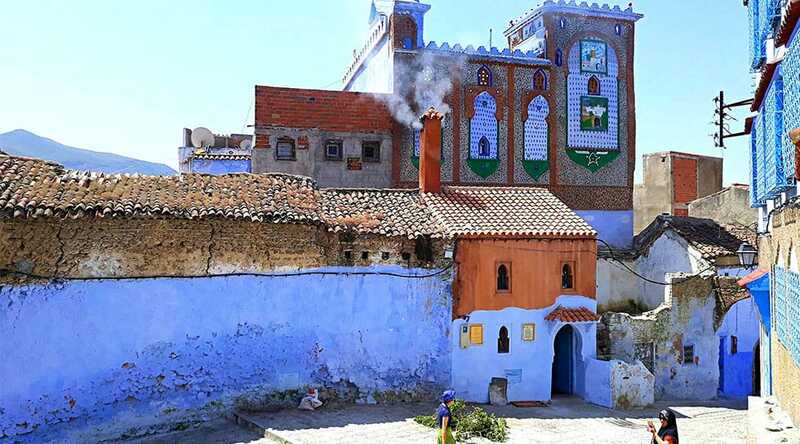 You will walk through winding alleys and enjoy the relaxed atmosphere that has been cooled even further with the painted blue walls. 08:00am departure to Meknes, which will take 3 hours and 30 minutes. Morocco has a history of wine production that dates back to the times of the Phoenicians, the Romans and more recently, the French. You will view vast acreages of vineyards as we travel. 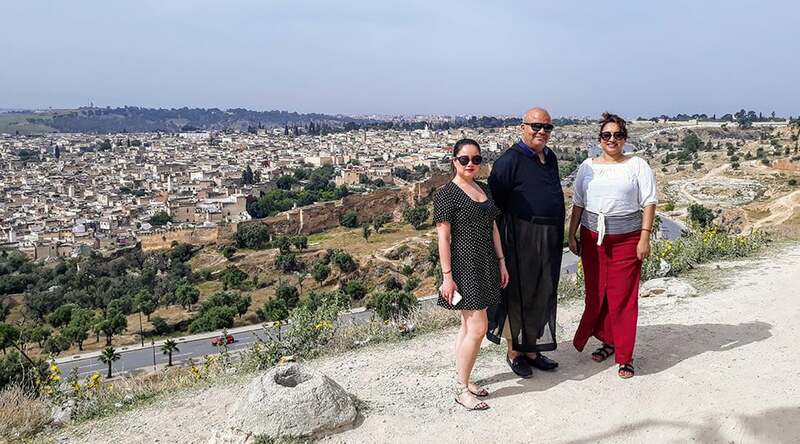 Explore the souks and historical sites in Meknes, which was a former imperial capital city during the reign of Moulay Ismail (1672 – 1727). Lunch at a traditional restaurant. Drive to Volubilis, which will take 40 minutes. Volubilis is Morocco’s best-preserved archaeological site which is also a UNESCO World Heritage site and explore the Roman Ruins. 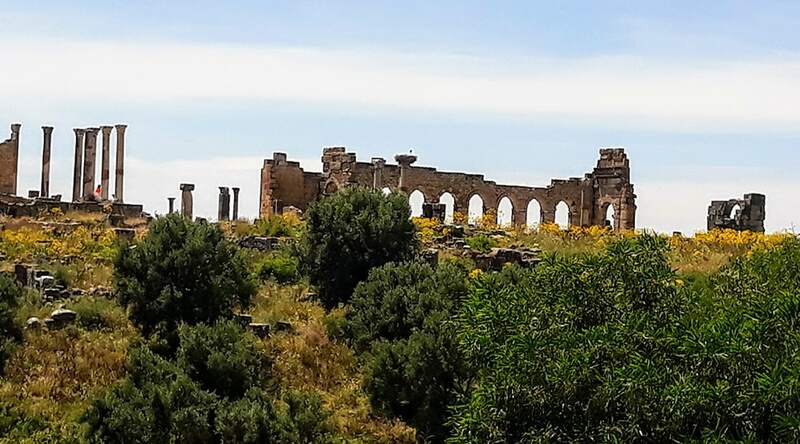 To learn about the Roman history, you may consider using a local guide or you may wish to tour the ruins by yourself and gain a sense of how the city would have been in 1 AD, amongst the fertile plains. 09:00am pickup from your hotel. We will drive to Rabat, which will take 2 hours and 15 minutes. Visit the Royal Palace and Chella, which is a UNESCO World Heritage site, and is also known as the Roman Ruins. Visit the Mausoleum of Mohammed V and the Kasbah of the Udayas. Drive to Casablanca, which is one hour away. Lunch will be at one of the many restaurants along the seafront, La Corniche. Sightseeing at the Hassan II mosque. Passing by Rick’s Café with photo opportunities. This is a recreation of the café used in the film Casablanca. Visit the Church of the Sacred Heart of Jesus (also called Casablanca Cathedral), which was built in 1930. We will continue sightseeing in Casablanca. Visit the Quartier Habous, also known as the New Town, built in the French in the 1930s. It has a mixture of French and Moroccan architecture. There is also a Jewish quarter. Drive to Marrakesh, which is 2 hours and 40 minutes away. Drop off to your hotel or riad. Pickup at 09:30am from your hotel. 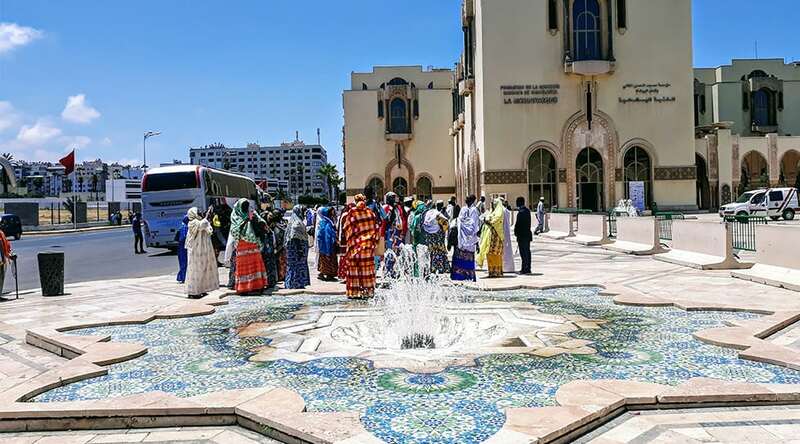 You will have a local guide who will walk with you into historical sites, such as the Koutoubia Mosque (built in the 11th century), the Saadian Tombs, the Jewish Quarter and Bahia Palace and Djemma el Fnaa. You will learn about the history and culture of Morocco. We will visit the serene Majorelle Gardens. It took French artist Jacques Majorelle (1886–1962) forty years to create his own little piece of heaven. The garden is famously known for it’s ‘Majorelle Blue’ building and exotic plants, as well as being restored by fashion designer Yves Saint Laurent. Your driver will bid you farewell and drop you off at your hotel or riad.